One of the most obvious differences between ceiling fans in the type of control they use. Deciding which type of control you would like isn’t always easy and there are a few things to keep in mind before you make your choice. Pull cord: The original method was to pull a cord hanging from the motor. It turns the fan on and off and sometimes change speeds. This option is still available in some traditionally styled fans. Ceiling fans with remotes offer many advantages, but they are not the right solution for everyone. Sometimes they are necessary, sometimes they are more convenient, and sometimes you are better off without them! There are cases where installing a fan will only be possible with a remote control. You may not have access to run the wiring through the ceiling and down the wall to install a wall control. This is common for apartments with another floor above them, where there is no access the wiring in the ceiling. However, there is a light in the room, so you can replace the light with a fan and light, and use a remote option to control both. 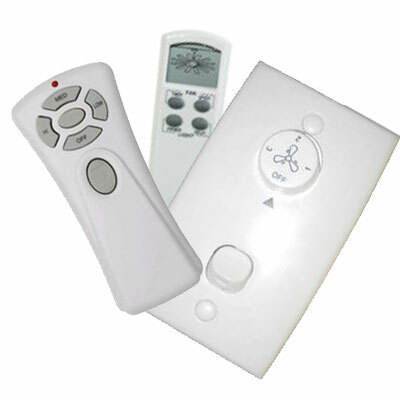 In a bedroom, a remote will allow you to turn the fan on and off from bed. If you have more than one fan: In a large space (such as a living room or restaurant) where you want to your fans simultaneously (ie they all turn on together). In this case, you can install radio frequency remotes, set them all on the same frequency. They will all turn on and on to the same speed from the one remote control handset. When you are better off avoiding a remote control! When you are on a limited budget. Remotes will usually add about $50-$100 to the cost of the fan. If you think the remote may get lost. This is sometimes a concern for people who have young children or pets in the house. You can get around this by choosing a model which comes with a cradle for the remote. If you don’t want to avoid replacing batteries. If you do not want to deal with flat batteries in the remote, a wall control or pull cord is a better option. Finally, remotes will break down over time and need to be replaced. Pull cords and wall controls are more durable ( unless some external factors causes damage to them) so they need less maintenance. So it’s really up to you if you decide ‘to remote or not to remote’. It depends on your situation, your preferences, and your budget! ← Fan blades: It’s not just size that counts!